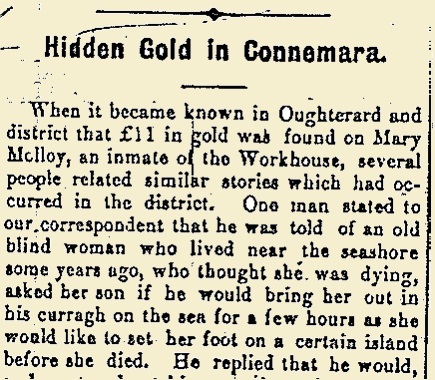 When it became known in Oughterard and district that £11 in gold was found on Mary Molloy, an inmate of the Workhouse, several people related similar stories which had occurred in the district. 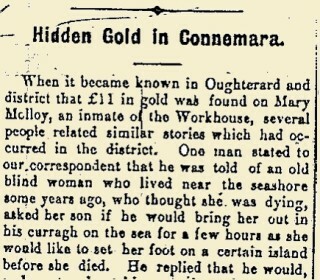 One man stated to our correspondent that he was told of an old blind woman who lived near the seashore some years ago, who thought she was dying, asked her son if he would bring her out in his curragh on the sea for a few hours as she would like to set foot on a certain island before she died. He replied that he would, and went and got his curragh ready. In the meantime a neighbour who was passing by the door observed the blind woman lifting a flag which was embedded in the hearth, and taking up a skillet, she folded it into her shawl and then walked to where the curragh was. The neighbour ran before her and told the son what he had seen. The son, Seagan, commenced to row backwards and forwards for about half an hour, until he got exactly within three yards of the shore. The mother unfolded her shawl and let the skillet drop out, remarking that it was an old pot that had been in her family for the past hundred and ninety-five years, and when her mother was dying she told her to drown it in a deep hole before she died as it could not be in the family any longer. She added that it contained nothing. When the son examined the pot, he found it full of gold coins.